The Activity Performance Measure (APM) is an innovative clinician-rated outcome measure of activity performance (i.e. activities of daily living) and participation for community-dwelling adults receiving healthcare and rehabilitation services. Activity performance refers to a broad range of activities of daily living, while participation is defined as ‘involvement in a life situation’ (p. 10) . The APM emerged from clinical experience of working with people with activity (ADL) limitations in a broad range of clinical settings. This included repeated difficulties measuring outcomes effectively using existing tools. A validity and reliability study has been published in Disability and Rehabilitation journal (link here) and it provided good initial support for the APM as a practical, valid and responsive measure with good inter-rater reliability, while also identifying areas for improvement and further validity testing. The APM is suitable for use in services treating people during or after an acute illness episode or health deterioration, or people with chronic health problems. As such the APM could be used in settings including outpatient services, early supported discharge, community rehabilitation, pain management, cardiac groups, or after an inpatient stay. It is particularly appropriate for services, which address broadly-defined everyday activity performance. The APM is a generic outcome measure and is intended for use with individuals with a range of diagnoses and multiple comorbidities, subject to further validity testing. The intention is that is suitable for use by any healthcare profession and services interested in quantifying activity performance and participation. Compared to existing ADL/functional measures, the APM integrates a number of innovations intended to correspond to the observable reality of how people adapt activity performance in the face of illness. The information required to generate the APM item scores is collected via a face-to-face semi-structured interview, once at admission and secondly at discharge. Administration can be combined with standard clinical assessment processes. The APM is open access and free to use for trial or internal projects, but formal training and certification are required when reporting results externally to guarantee quality standards (see Permission to Use). It can be administered by anyone educated to degree level or above in a healthcare related subject. Experience of working in clinical community settings is desirable but not essential in completing the APM. In terms of processing the data, once the item scores have been produced, then they are entered onto an Excel spreadsheet, which automatically generates the Activity and Particiatpion Summary scores. These scores are then available for further processing depending on reporting and study design. The initial validity and reliability study suggested that it may be possible to reduce the burden of evidence generation on the service by collecting data for a relatively small sample of service users, rather than having outcome collection as a standard part of service. This would need further investigation on a case by case basis. There are 28 activity items in the APM. Some of the items are scored on the basis of independence, while others are scored according to the person’s preferred lifestyle. Activities 1-14 scored on basis of independence Activities 15-28 scored on basis of individual lifestyle. Only the items relevant to each individual are scored. The generic rating rules are given below and there are more detailed rule descriptions for each activity item in a manual, which is freely available from the website. For activities scored on the basis of the person’s lifestyle: Performance is not adapted to compensate for health problems, but reflect his or her lifestyle preferences. In other words the person may share the activity with someone else, pay for a service, or be independent, but this performance method is at the person’s discretion, rather than a result of health problems. For activities scored on the basis of independence – performance does not involve the assistance of another person or equipment. Performance is affected by clinically significant symptoms, signs or limitations. The environment has been modified to facilitate performance of the activity. The person uses a mobility aid. The way the activity is performed has been adapted to compensate for health problems, e.g. location, timing, transport method, frequency etc. The person performs fewer tasks falling under this item or avoids it. 2 Moderate limitation:⇒ Accompaniment, supervision, prompting or set up is provided by a significant other or service provider during the activity due to health problems. Hands-on physical assistance is provided by a significant other or service provider with the activity, e.g. assistance with transfers and mobility, or physical assistance with task completion. Rate as 1 even if physical assistance is required for only part of task. 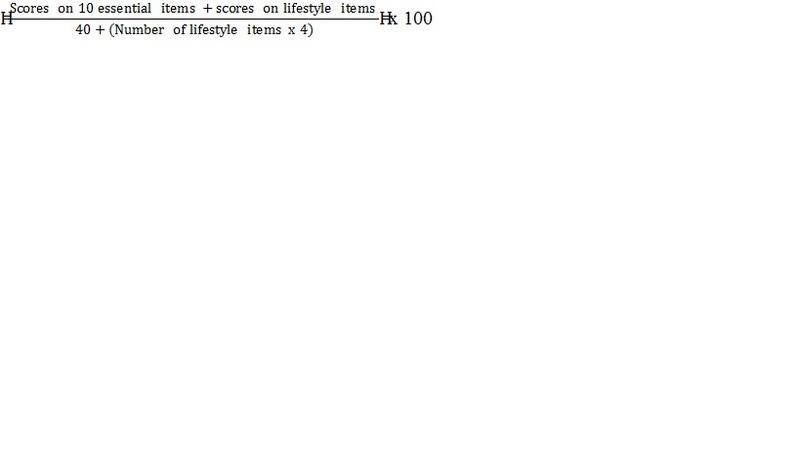 To get a score of 1, the person must still perform some of the activities and tasks falling under the item. The person does not perform the activity due to health problems. Someone else performs the activity on behalf of the person due to health problems – this could be a significant other, the care system or a paid service. Rate as –5 if: you have recommended that the person does not perform the activity (in this way). And: The performance method puts the person at immediate risk of serious injury or harm in your opinion, or it appears unlawful. This does NOT include minor safety recommendations. Not specified – Insufficient information available to score performance. Not applicable – Never does – Not part of the person’s habitual lifestyle. The theoretical background and underlying assumptions to the APM were described in Disability and Rehabilitation. This web page describes the APM scoring approach in greater detail, including some general principles and in relationship to the World Health Organization’s International Classification of Functioning, Disability and Health (ICF). Developing an outcome measure based on the ICF requires the classification of how a person performs each activity item on a 5-point ranking from no or negligible limitation to complete limitation. When independence is the criterion of successful performance of an activity item, the situation is relatively straightforward. In the APM, independence is considered to be the normal performance method for the 14 activity items listed above. However, when the normal performance method is based on preference rather than independence (the other 14 activity items), scoring successful performance is more problematic due to the wide variation in 1) varied “normal” activity performance and 2) how people respond to health problems. One complication here is that any one behaviour or performance method can have different meanings in terms of disability, depending on the person concerned (for example in response to acute hip pain, Person A may cease going to the supermarket and go to local shops to minimise walking distance. But Person B may do just the opposite). For this reason a semi-structured interview is used to clarify what a given performance method means for that particular individual. This includes exploring premorbid and other time points, and probing further when required. In many teams this would be a standard part of clinical assessment. The approach adopted in the APM to these lifestyle-based items is to base the highest score (APM item score 4 – No or negligible limitation) on the person’s habitual performance method, as long as this performance method is at the person’s discretion, rather than a result of health problems. Guidance is given on how to determine this distinction in the training and manual. Changes to habitual performance methods to compensate for health problems result in lower item scores. In terms of the changes used in the APM scoring system, the focus is on tangible, readily identifiable aspects rather than qualities such as subjective perceptions of difficulty or satisfaction, which are more open to variable interpretation. Therefore the next score (Mild limitation – APM item score 3) is used to classify a range of responses, which can be considered to equate to roughly equivalent levels of activity limitation. For example in the case of hip pain, one person may choose to use a walking frame, another may change the frequency and location of tasks involving walking, while another may choose to endure the pain and walk unaided due to dislike of walking aids: the decision involves personal preference, and there is no reason to assume that any of these performance methods represents more limitation than the other. The non-habitual involvement of another person providing accompaniment, supervision, set up or monitoring is the next score down (Moderate limitation – APM item score 2). The rationale for this is that the presence of another person due to health problems is associated with unwanted characteristics such as risk to self and other, inconvenience, lack of control, dependency and ineffectiveness. The provision of physical assistance indicates severe limitation and is APM item score 1. To score 1, the person must still perform some of the task components falling under the activity. Complete limitation – APM item score 0 – is not taking part in a previously habitual activity in any capacity. There is an additional lowest possible score (-5) for situations when performance appears unlawful or so unsafe, that it appears to involve immediate risk of serious injury or harm, and the therapist has recommended that the person does not perform the activity in this way – this does not include minor safety recommendations. For example, a person with severe cognitive and visual impairment may consider that driving is not the slightest problem, despite being barred from driving by the licensing authorities. It is expected that in general this will be unusual, but it is a relevant aspect of clinical practice that comprehensive scoring systems need to be able to handle. Other options include not applicable/never does for when an activity is not in a person’s habitual activity repertoire and not specified (not scored due to lack of information). The raw scores on the individual items are combined and processed to produce the following standardised summary scores. This is done automatically via an Excel-based app. Activity Summary– This measure represents the degree of activity limitation at each time point. In this case, the item scores are transformed to produce a standardised score to allow comparisons between individuals, regardless of differences in habitual activity repertoires. A maximum score of 100 indicates no or negligible activity limitation. The lowest possible score is 9, equating to high-level nursing care. The Activity Summary is weighted to automatically include performance of 10 essential items namely mobility in the home, mobility<500m, mobility >500 m, steps, stairs, shower/bathe, dress, groom, toilet, eat and drink. The reason for this is to avoid giving misleadingly high scores to people, who perform low numbers of activities. These 10 activities were chosen to always be included in scoring because their regular performance can be considered a normal part of healthy human living. The remaining “lifestyle items” are included depending on whether they are part of a person’s particular lifestyle. The rationale for standardising the Activity Summary is to be able to produce comparable metrics between different individuals despite the large variation seen in lifestyles and clinical presentations. For example, the lifestyles of a married male pensioner and a single mother with 2 children will generally vary greatly in terms of the kinds of activities performed, the times and locations, the other people involved etc. But if there is no or negligible activity limitation for either, then it is meaningful to reflect this in a standardised score for both individuals of 100. Similarly activity modifications, which appear quite different at one level, can also be interpreted as comparable illness-related activity limitations by those particular individuals, and this is reflected in the scoring system. The intention is that standardisation using highly tangible performance features will allow meaningful comparisons of activity limitation and rehabilitation improvement across the broad range of lifestyle preference, clinical presentations and social circumstances encountered and treated as standard in clinical settings. The following are indicative normative score ranges – see Chapter 3 for a fuller discussion. 100 – no or negligible activity limitation. Participation Summary – This is a count of the number of activities, which a person participates in at the time point (participation is defined as getting a raw score of 1-4 on the item). The range of the Participation Summary is 6-28. A score of 6 indicates high-level nursing care, 28 would indicate a person with a very full range of personal, domestic, transport, productive and social activities. The focus in the APM is on participation as performance, rather than subjective aspects. The justification for scoring participation as a count of items, where a person has some involvement, even when limitation is present, is that people can still be considered to show participation in an activity, even when assisted, due to the possibility of directing and shaping aspects of it. Similarly participation can continue, even when a person adapts her or his habitual performance methods. Therefore the approach taken in the APM is that the cessation by a person of a habitual activity is a clear and readily identifiable marker of a high degree of participation restriction in a given domain. This also has the advantage of showing less scope for subjective judgement. The scoring approach in the Participation Summary also deals with some of the issues identified in quantifying participation. For example in this case having standardised scores (for example 100 = maximum or ideal participation) would be problematic given individual variation. Similarly norm-based approaches to the quantification of participation (e.g. low, medium and high participation cut-offs) have limited relevance for the same reasons. Conversely changes in the life areas, where a person is involved (in this case across premorbid, admission and discharge time points), offer a useful indicator of the impact of illness and rehabilitation on participation levels for that individual. For example if we know a person has reduced the domains (items), in which s/he participates from 20 to 13 following illness, including all activities outside the home, then this is meaningful information about participation and suggests areas to be addressed in rehabilitation. Similarly progress during rehabilitation to involvement in 19 activities (for example) would indicate a much greater improvement compared to 14. It would also be possible to generate more detailed data about items or groups of items of interest and this would add another layer of information concerning rehabilitation effectiveness. With the accumulation of further data and experience, it may be that other ways of characterising both activity and participation emerge. The APM also has an additional option for capturing changes in activity performance at a more compensatory level, like equipment change, the introduction of new transfer methods, care arrangements and so on. While these may not always count as an increase in APM item scores, nevertheless they are very valuable to service users in a range of ways – for example they may help manage symptoms, increase safety or ease carer burden. If desired, the APM can capture these changes (there is a simple yes/no tick box to indicate if performance has changed). These items are then counted up as an Adaptation Summary, with further analysis possible of the kinds of tasks where positive adaptations have been facilitated (e.g. indoor mobility, bathing, etc). Having information about both the range of activities performed (participation) and performance limitations (activity) can provide a broad picture of service user performance change during a healthcare episode. But other ways of showing change are also available via the APM, for example items of most change or similar items of interest (e.g. community activities). This could also be combined with information about service inputs such as therapist and carer interventions. It is hoped that this combination of a comprehensive overview with flexible focus will open up new ways of evaluating and demonstrating quality and effectiveness. World Health Organisation. International Classification of Functioning, Disability and Health. Geneva: WHO; 2001. Perenboom R, Chorus A. Measuring participation according to the International Classification of Functioning, Disability and Health (ICF). Disabil Rehabil. 2003;25(11-12):577-587. Whiteneck G, Dijkers M. Difficult to Measure Constructs: Conceptual and Methodological Issues Concerning Participation and Environmental Factors. Arch Phys Med Rehabil. 2009;90(Supplement 1):S22-S35. Dijkers MP. Issues in the Conceptualization and Measurement of Participation: An Overview. Arch Phys Med Rehabil. 2010;91(Suppl 1):S5-S16.